Just had the nicest conversation with Lloyd Maines after he got through doing a mini set with Terry Allen in Studio 1A here in Austin. Super nice, genuinely interested in talking and helping out a new steeler. Sometimes meeting your heroes works out great! I'm a huge Terry Allen, Lloyd Maines fan, is this for a new CD or what? You are right Charlie, but there have been a ton of people coming out of Lubbock and TTU as well, Amanda Shires, Flatland Cavalry, Wade Bowen,Josh Abbott, William Clark Green, John Baumann, Pat Green, etc. Most do head to Austin, but it's amazing how much talent is spawned out on the plains. Hope you are getting prepared for the storm this weekend. I've been wrong about the weather here so far, so we're getting ready. Pam is always ready. Going out for beer today. Craig Stock - Terry did mention that they wanted to make a new record but was also clear that they haven't started yet on the actual recording. At this point I don't remember any more if what we heard was all new material. I was just taking it all in, and watching Lloyd like a hawk. Eventually there will be video here: https://www.vuhaus.com/happening/austin . You can also see the performance last year if you search. Good to hear about new Terry/Lloyd activity. There's a new release of old material coming up including "Pedal Steal" (about a fictional steel player) together with some radio plays - I think this is mostly spoken word and sound collages. Definitely get the vinyl remasters of Lubbock and Juarez if you don't have them, they come with huge booklets with essays and loads of Terry's art. You got that right, Craig. It's really shocking how much musical talent has come out of that one little town, going all the way back to Buddy Holly. Not to mention the principal three guys in the Flatlanders (Jimmie Dale Gilmore, Joe Ely and Butch Hancock), the Maines family, Mac Davis, Delbert McClinton... 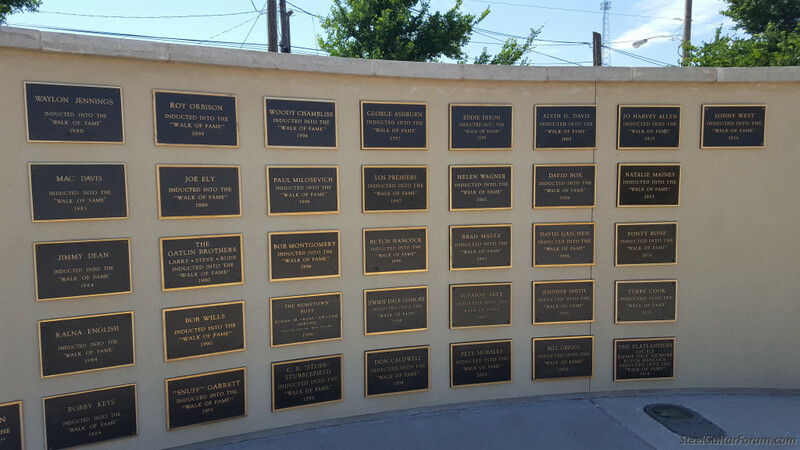 The list goes on and on, and it just defies logic that so many people could come from there while a nearby town like, say, Amarillo hasn't produced a similar bounty. 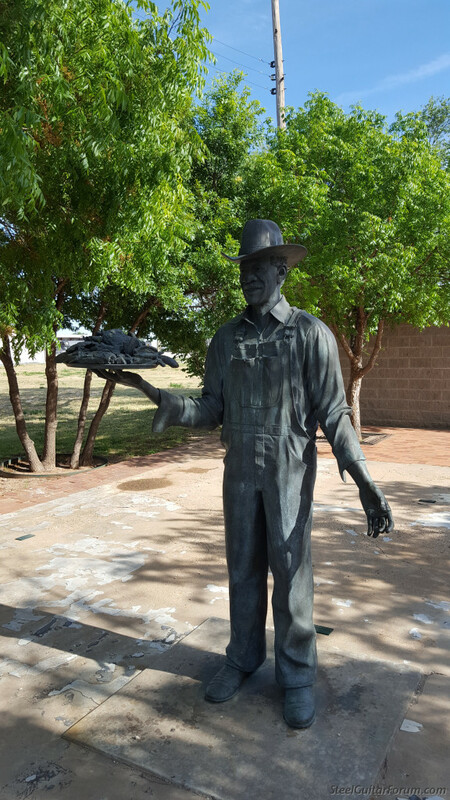 All hail Lubbock -- and of course, Lloyd Maines! Wait... Waylon is from Lubbock? I didn't know. (You were smart to get Delines tickets in advance because I heard it was sold out. No steel, but I will be playing with them next month when they get back from tour. If you happen to be in Portland then... even better if you show up with the resurrection of your Neil Young tribute band). Ah....Terry Allen. There is a name I haven't heard since I left Austin in the early 80's. I wore out that Juarez lp. And then I completely lost track of him. Good to know he is still out there. Looking it up Waylon was originally from Littlefield, about 30 miles from Lubbock. I think he first moved to Lubbock when he became a DJ in the mid 50's. I really hope there's a music museum there or some kind of commemoration to all that talent. The gig was at Rough Trade Records East London, totally packed out. Bummer to miss you but I got to meet the band, pick up the new album and as a bonus I was amazed to find a new 1st time vinyl release of Willy Vlautin's Northline LP with Paul Brainard - one of my favourite 'steel guitar' records. So I got that signed too. Funnily enough Juarez was in the racks too and I had a chat with some people about Terry Allen. Weird! The Neil Young tribute band is LONG since defunct! The gig was at Rough Trade Records East London, totally packed out. Bummer to miss you but I got to meet the band, pick up the new album and as a bonus I was amazed to find a new 1st time vinyl release of Willy Vlautin's Northline LP with Paul Brainard - one of my favourite 'steel guitar' records. So I got that signed too. One of my favorites too, and I thought it was only available as a CD stuffed into the back cover of Willy's "Northline" novel (a musical soundtrack to the book. How cool is that?). Glad to hear it's now available elsewhere. Paul Brainard on steel is the man, even though he's not from Lubbock. OK, I'll stop highjacking this thread. 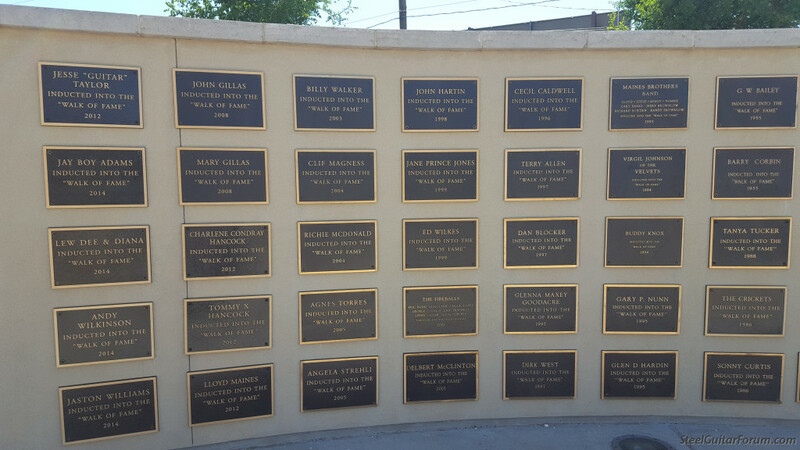 This is the West Texas Walk of Fame in Lubbock, if you zoom in, you can see the ton of talent that came from and around the Hub City. 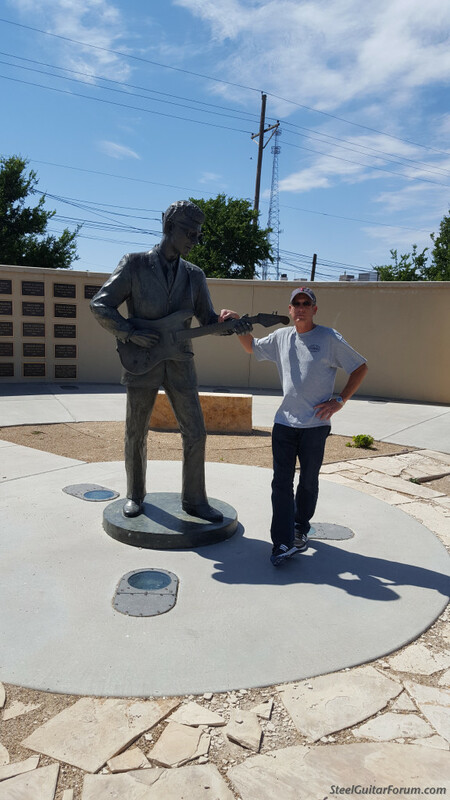 That's me next to the Buddy Holly statue. Jonathan, Yes there is the Buddy Holly Museum and J.I. 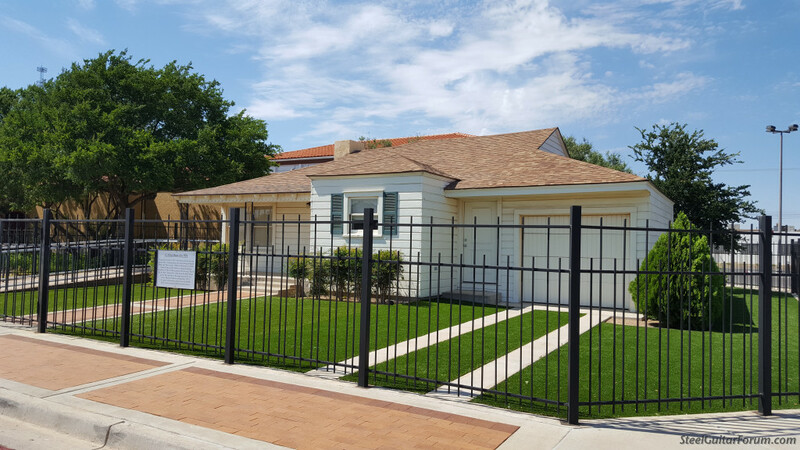 Allison's original house moved next store and restored. 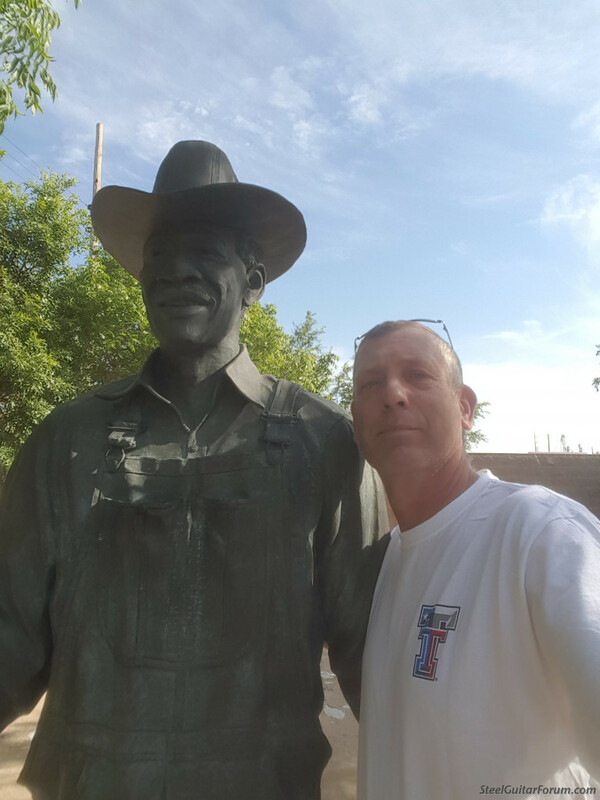 Craig knows more about Lubbock than I do and has the photos to prove it. 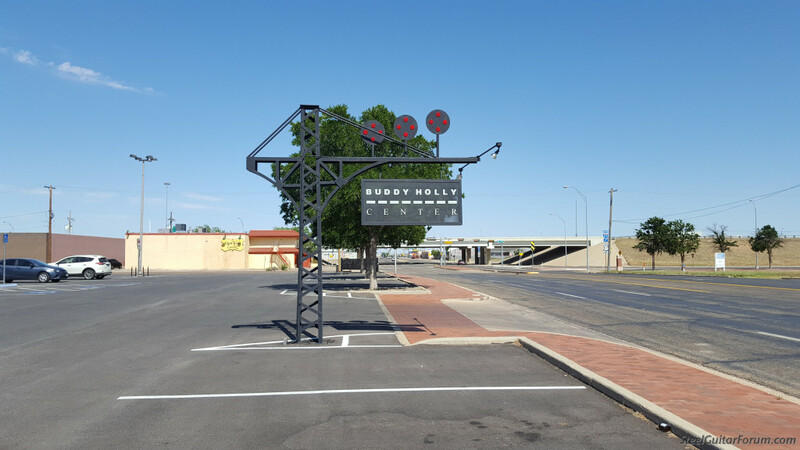 Last night there was a show on TV (Project Blue Book) about the Lubbock lights that Craig reminded me of, the sort of thing Terry likes to write about. Terry is on the wall, first picture 5 over from left two down from top. 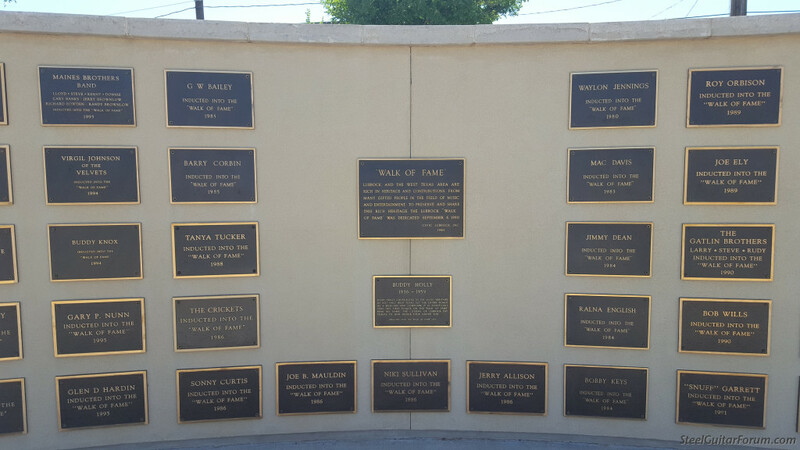 Thanks for the photo, My dad John Hartin, was inducted but I had never seen the plaque. Thant's really neat Gordon, I looked up your dad and is he the one that lives in Levelland now? Could you give us a brief bio on him? I'd appreciate it. 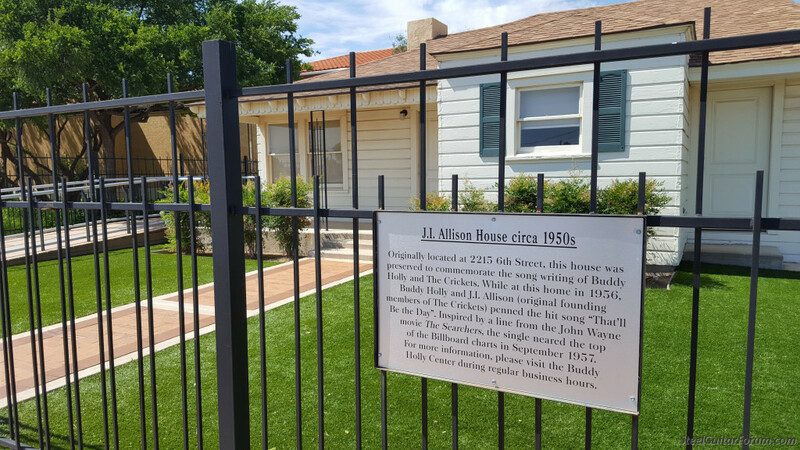 I've been to the Buddy Holly Museum/Jerry Allison's house, and It's a worthwhile visit if you're in Lubbock. Lot's of interesting memorabilia on display; Buddy's high school stuff, posters, guitars, clothing, and BH's black rim glasses. Buddy must have been a small man, because he wore a size SM tee-shirt. Interesting. Now owns and operates Texas Music Supply, where he is still giving guitar/banjo/pedalsteel lessons. Thanks Gordon, That's the guy I saw, very cool. Yes Herb, the Museum is really nice on the old Train depot in The Depot District of Lubbock, a nice arts and Entertainment area of Lubbock in nice old historic buildings. 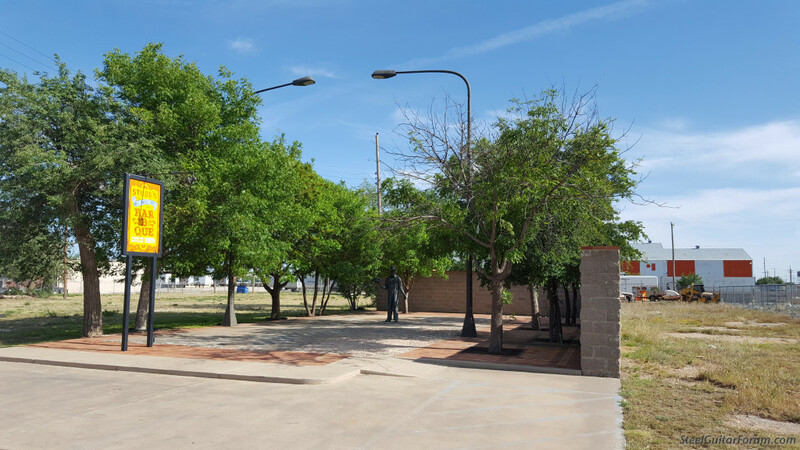 Also sad but nice is the old site of Stubb's BBQ where there is a nice Bronze Statue of Stubb done by Terry Allen, yes he's a sculpter too. I met Stubb a few times and he was a nice guy, spent time in Jersey in the Bayonne Shipyards during his military service, I think he said his kids resided back here, but that was a long time ago. Stubb was a tall man. 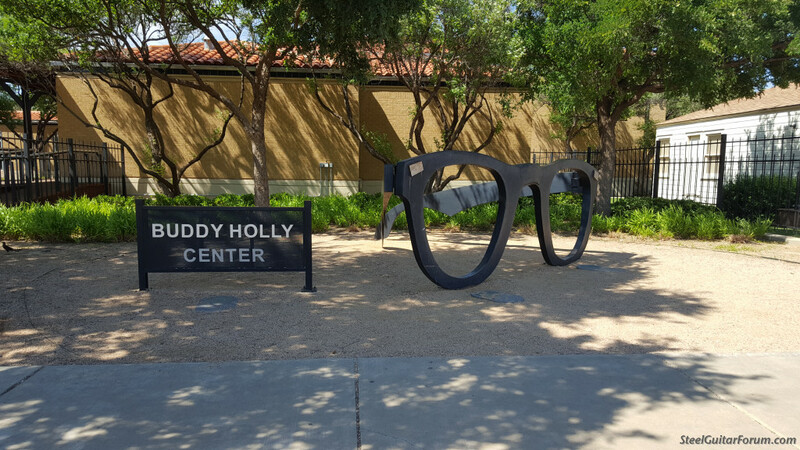 Another shot of the Buddy Holly Center, done well and really worthwhile seeing. Herb, not sure if you noticed but the newest Michael Murphy cd has a mention of you in the liner notes. The recording is really nice. 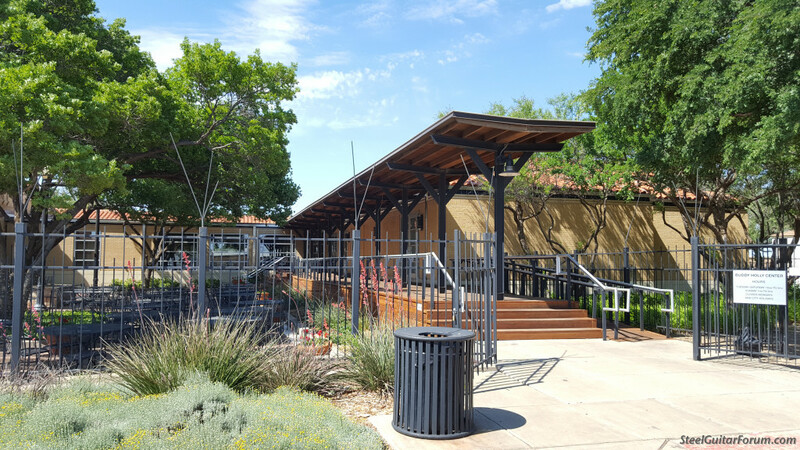 When Stubbs moved his restaurant from Lubbock to Austin, he opened his place in a small shopping center a half mile from my house, and used to have jam sessions there along with great BBQ. Stubbs would get up and sing, and Stevie Ray was there often, loooong before he became "the" Stevie Ray, just hanging out. Kind of a neighborhood musicians' center in mid-town, 40th at IH-35. It got closed down and bulldozed in the late 80's when the shopping center got expanded and CB died in the mid-90's as I recall.